Let’s face it; no person came into this world with expertise in writing a sales pitch email. I’ve certainly never met someone who has it as an innate skill! Sales emails, for the better part of the past couple of years, have had quite a complex reputation. Some people treat them as no better than spam, while others say that they are an indispensable sales tool. Sales pitch sales emails will pretty much make or break your whole sales process. And just like cold call templates, creating an email template for sales is no easy task. 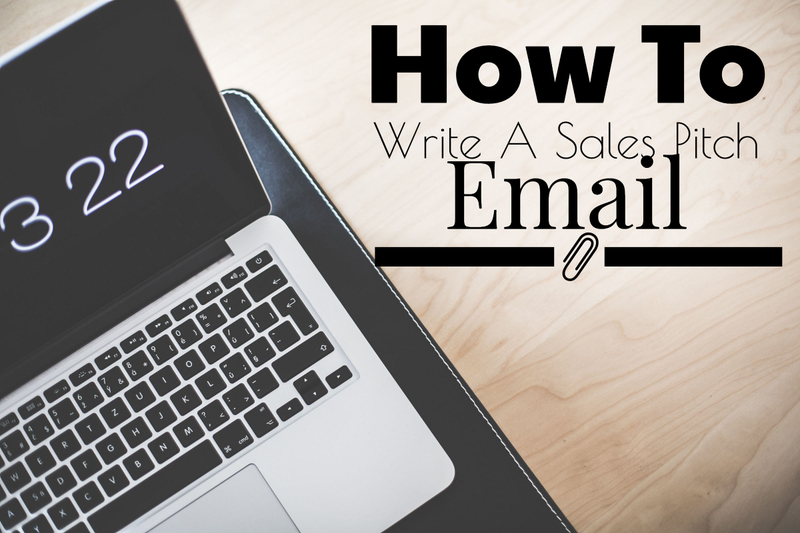 If you’re interested in discovering how to write a sales email that will give you a substantial amount of good responses, let me walk you through! Now, the very first thing you need to get a handle on seems pretty easy. What exactly are you selling? Not only does this dictate what your sales email is about, but also how you’re going to structure your entire sales process. It goes without saying that selling a subscription service is going to be vastly different from selling a one-use product. I know what you’re thinking right now. Easy enough, right? Think again! Your offering for a certain product or service you’re selling can easily be lost in translation while you construct your email. I’ve discovered that this is doubly true when you have a lot of options to select. The bigger the company you own or work for, the more likely that it has more than one income streams that make up its net revenue. I’m sure this makes the risk of being vague all the more real. A good salesperson can’t afford to confuse a prospective client by offering a service and that service bundle plus free popcorn too! Nine times out of ten, you’ll get confused responses, indecisive clientele, and – worst of all – disinterest. Make sure your sales pitch email delivers the message in a way that helps your prospective client understand what you’re offering. Ideally, it should be contained in a single phrase or sentence. Anything longer and you might want to go back to the drawing board. By keeping it short and sweet, even a brief skim of your email will pique your lead’s interest. What makes your product valuable to your customers? Is your service something that others would find a demand for? These are some sample questions you can ask yourself before trying to make a sale. In many cases, both a cold email and a cold call template are structured around the very concept of value. I’ve learned that it is essential to understand what exactly you are offering to address whatever your prospect’s personal or business need is. Not being able to answer this question is equivalent to not closing the sale. Your offering needs to be geared towards making life better for your clients, and it’s up to you to answer the question as to how and why it is so. Now, you can pretty much just copy and paste all the features and benefits of whatever you are selling. In most cases, the recipients of your sales pitch email do not know or understand exactly how they can benefit from the product or service you’re trying to sell. On top of that, they are in a position of unfamiliarity, a stranger to both you and your company. It falls on you as a salesperson to cram all of that value and possibility into a single value statement or proposition. I’ll grant some brownie points if you can jam in a relevant statistic to back your statement up. Again, vague is never good, and the existence of cold hard numbers make your value statement all the more concrete. The third step you’re going to factor in has to be done simultaneously with the previous two. You will eventually be asking yourself, “How am I going to approach this prospect of mine?” It doesn’t matter if you’re the VP of Sales in your company or just a junior salesperson working your way up the ladder. Understanding who you’re selling your product to and knowing which approach to take is half the preparation done. Understanding the personalities and similarities of your prospects does take some time. In a pinch, you can stick to a specific sample group focus which shares the common ground. Personally, I opt to have about three to five leads. Once your research is complete, you can then tailor your sales email templates to be more interesting. One way to do this is via mail merge, which is a method that allows you to send a personalized sales pitch email to a multitude of people. Take note that utilizing this process means that only some parts of the email will be customizable with the majority being fixed text. Personally, I find doing this process manually as a waste of time. 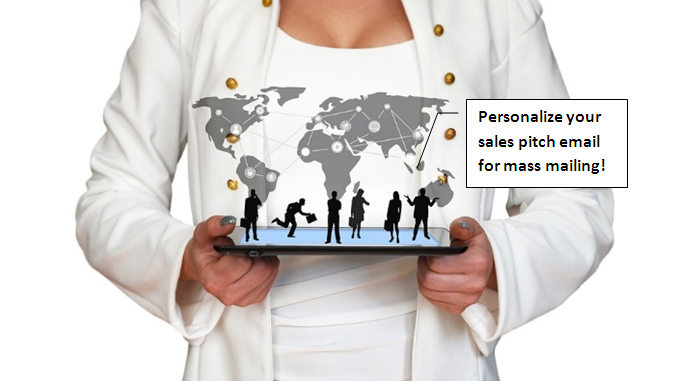 Any successful businessman or salesperson needs to know when to delegate and let professionals do their work. Roojet is one of many service providers who can help you attract customers via cold email campaigns. Not only does it seamlessly integrate with my existing sales cycle, but it also saves my time and energy to ultimately gain an edge on the competition. Despite the fact that you will be dealing with some clients via a cold sales pitch email, creating a connection between you and the recipient is far from difficult. How? You might ask. Just fashion up a hook that will warm the relationship and create common ground between the two of you! Usually, this means citing a referral or mutual acquaintance, relating to them via shared experience, or simply just showing them that you did research well without coming off as a stalker. Referrals and mutual acquaintances are by far the most comfortable and risk-free way of creating a warm-up hook. I’ve personally had the most success with this specific method. Just tell your clients who referred you to them or drop a name of a person you mutually know. Shared experiences are equally effective but require a bit more finesse in mentioning. Professional get-togethers like conference panels or talks – even if you’ve never personally met them – are common enough. Being mentioned on the same social media platform like a blog post or YouTube video is another example. Just make sure that the shared experience isn’t a negative or awkward one. You wouldn’t want your sales pitch email to trigger any unsavory thoughts or memories. On to cold prospects! Despite having little to no commonality with your prospect, I believe you can always lead by saying something exceptional about them. It might be a paper that you enjoyed or their guest appearance in a specific conference panel. Share your thoughts on what they have said or written to show them that you really have been paying attention. You might be thinking if having custom warm-up hooks for each of your prospects is necessary. Would you rather stay mediocre? No. Otherwise, going that one extra mile will lead you to quite a successful turnout once you send out that sales pitch email. Include their name or, if applicable, their company’s name. More often than not, just seeing their name in an email will generate that spark of curiosity. “How” or “why” are very powerful words, especially if it leads to a question that can’t be answered by just a yes or no. The best way to do this is to create a subject line that speaks to the purpose of your sales pitch email while offering them something in return for opening the said email. As always, brevity is king. The already short attention span of a human being decreases when faced with monotonous tasks and routine actions. You have only 50 characters to convince someone to open your email. The shorter the subject line, the better. When you’re trying to send out an effective sales pitch email, always remember that the person you’re sending it to will most likely be dealing with hundreds if not thousands of other emails throughout their week. Speaking from my own dealings with a seemingly never-ending email inbox, a dull and uninteresting subject line has a 99% chance of going straight to the Trash. If I were to mention some prime examples on what not to do, do not capitalize everything, avoid unnecessary punctuation, and remember that a deceiving subject line is a one-way ticket to losing a potential customer. While tempting to do it at first, clickbait subject lines for a sales pitch email have begun dropping in popularity over the last few months. The worst subject line ever? The “You Won’t Believe This Shocking Secret” is reported to be the most ineffective way to get prospects to open a sales pitch email. Trust me on this one. With the planning phase over, you now have to synthesize everything that you have prepared for the creation of your sales pitch email. Just like boxing, lead strongly with your warm-up hook! Create that connection or common experience that warms the relationship between you and your potential client. Also, open up by congratulating them on a recent achievement or milestone they have reached professionally. Be genuinely enthusiastic but not too the point of over-familiarity. Start the connection by focusing on them and not on yourself. Remember, you close the sale based on their decision. Begin with the end in mind! Email and cold call templates need a value offering just like a plant needs water. Your sales pitch email should have a very quick and precise statement, focusing on how you can address an existing need or problem your client currently faces. I would compare it to the right hook that follows the left jab. It should take no additional effort on your prospect’s part to understand who you are, what you’re here to offer, and why you should be the person they should work with. If you can do so, drop a relevant statistic or number that will make your value statement more concrete. When it comes to demonstrating value, it has been proven that quantifying trumps qualifying. Remember that we’re supposed to be focusing on the benefits the client might be able to obtain from you. Reserve technicalities and overlong feature descriptions for later conversations. You are selling something, so sales is the ultimate goal of your sales pitch email, right? It is nearly impossible to close a deal on the first interaction, especially if this is a cold prospect or lead. What you are looking to achieve at this point is a means to establish a continuing dialogue between you and your prospect. Cap off the sales pitch email with a solid call to action statement. Don’t be afraid to ask for something detailed. It could be a meet-up for dinner at 7 PM next Wednesday or just a quick phone chat tomorrow. By being clear and concise in your intent to further discussions with your client, you’re making the next step easier for them and, ultimately, for you too. When it comes to ending your email, make your emotion palpable. Don’t make all that hard work and research go to waste by a generic “Hoping to hear from you soon” which I have done in the past. Instead, make your potential client feel that you are more than excited to get in touch with them again. If you successfully convey the right energy to your prospect, your chances will be that much higher. A signature in a sales pitch email isn’t that important for some people, but keep in mind that when you craft that email, every single detail has to be tailored to your purpose. Sometimes, an intricate email signature detracts from the email itself, with all the logos, links, and even your headshot taking up unwanted attention! Whenever possible, shave off those unnecessary add-ons to your email signature. In my opinion, an optimal email signature should include your full name, position in the company (if applicable), and contact options for your lead to get in touch with you. After covering the basic steps and components of an optimized sales pitch email, there are still some tidbits that will certainly help you improve your results. Sometimes, we get the impression that we are bothering someone when we attempt to make a cold call or cold email. This often leads to an apologetic writing tone. Remember that you are giving them something valuable. Avoid being vague and wishy-washy in what you’re trying to accomplish. People appreciate straight shooters. Be willing to follow up! Again, you will almost never close a sale on a single interaction with a customer. The right amount of persistence is the key. You can leverage the use of playful or unusual terms to stand out from the rest of the generic business emails littering your prospect’s inbox. Exercise caution and be sure to keep it at one or two words at most. Subject Line: The Expansion of (prospect’s company name)! Congratulations on (cite an achievement or milestone they have done in the last six months). I could just imagine how elated you are in seeing all that hard work pay off! You can easily increase your (metric of performance) by (cite an actionable number of percent) if you (cite a business need that you can address). I’m in the perfect position to assist you because (insert your compressed value statement). Does this interest you? Let’s chat about how we can work on creating the best opportunities for you/(company name). How does (state a specific time, date, and place) sound? (Prospect’s company name) has blown my mind with (the reason why you love the prospect’s company)! I’ve definitely got my eye open to see what you can think of next! As a (your position or role), I can help your company (insert your value offering) by (succinct action plan). Let’s talk about how we can make this happen! I’m free (state a specific time and date), which would be the best for you? Subject Line: Let’s Talk About (prospect’s company) Success! The work you’ve done at (prospect’s first name) is incredibly eye-catching, and I felt that I had to get in touch with you. As (your role or function), it felt right to partner with you to (insert value offering) by (insert action plan). Let’s meet up and get to know each other a bit more at your convenient time. I’m so excited to hear your success story! Would you be available on (cite a time and date) via (contact method)? You might be thinking about how you can customize a sales email template for each of your emails right now. With today’s technology, you can do just that by utilizing the services offered by some trusted businesses that deal with innovative cold prospecting. It is possible to make every sales pitch email feel special by working with companies such as Roojet, who can help you via cold email outreach programs. These specialized campaigns can provide you not just cold leads but clients and return customers that will ensure your success. For those who prefer a DIY approach, here’s how you do it: pick one sales pitch email, look it over and make sure that it feels as personal and striking as possible, and then identify the components that you can reuse as a template which you can use to great effect repeatedly. I’ve noticed that creating one sales pitch email for each industry, lead type, and company positions is very effective to achieve a versatile template. And there you go! You’ve done it! Don’t be too quick to rest on your laurels, my enterprising friend! Remember that writing a sales pitch email is just part one of two. Any salesperson worth his or her salt knows that closing the deal is an intrinsic part of the second part: following up. Always monitor email opens with email tracking so that your responses come in a timely manner. In the worst case scenario where only a small portion of your emails are getting opened, don’t fret. I’ve had my share of the very same thing happening. In order to have more time to work on connecting with my leads, I let Roojet assist me via their automated follow-ups. This way, I can make sure that no potential client slips through the cracks due to inattention. Now, if your follow-ups don’t fall through the next step is to head back to the drawing board and figure out what exactly is causing the problem. Sometimes it could be a technical issue such as your contact information is invalid, or an error in the way your emails were being sent. Other times, there might just be something you need to work on for your sales pitch email to work. It could be a minor mistake in the way you phrased your subject line, or not being attentive to what type of leads you are dealing with. In any case, once you identify the problem, you can then use this to streamline your progress and build on your opportunities on your way to success! To wrap it all up, figuring out the secret on how to write a sales email isn’t a mysterious path to be paved by the favored few. As long as you don’t let yourself be intimidated or stay in your comfort zone, writing a solid sales pitch email will start becoming a natural part of your sales cycle. Remember, just because it isn’t long or technical doesn’t mean it can’t pack a punch! Just be short, clear, and positive about your brand, product or service. By making your email or cold call templates conform to the steps we’ve discussed above, not only will you save time and energy with an effortless prospecting process, but you will also have responsive prospect leads. In the end, this means more sales and success for you! If you want to experience the same amount of success I had with reaching out to potential clients, why wait? Follow that gut instinct and work with someone who will elevate your game. I want you to start making the perfect sales pitch email with Roojet now! The Ultimate Tips for Writing Cold Emails to Prospective Employers Attachments in Cold Emails: Should We Ever Use Them?